(ANNOUNCER)>> SO FAR WE'VE MADE OUR F-150 HANDLE LIKE A RAPTOR, BUT IT NEEDS TO FLY LIKE ONE TOO. 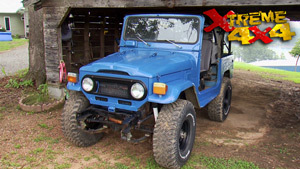 TODAY ON XTREME 4X4 WE'LL TURN THIS WORN OUT LIGHTNING ENGINE INTO A STUMP PULLING BEAST. 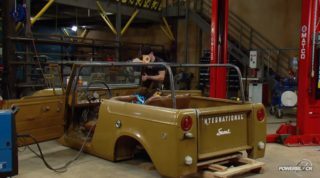 PLUS WE'LL GO INSIDE THE RIDE AND FIND OUT WHAT IT TAKES TO BUILD A JEEP SPEED RACER. (IAN)>> OUT HERE IN THE WAREHOUSE IS WHERE WE PARK THESE PROJECTS IN BETWEEN SHOWS. WE'RE EITHER WAITING FOR PARTS OR WORKING ON OTHER RIGS. THIS IS EXACTLY WHERE OUR HALF PRICED RAPTOR HAS BEEN SITTING FOR A COUPLE OF MONTHS. NOW SO FAR WE MADE PRETTY GOOD HEAD WAY ON THIS RIG. WE'VE GOT A HEAVY DUTY UPGRADED REAR AXLE, LONG TRAVEL SUSPENSION BOTH FRONT AND REAR, AND A SHOCK PACKAGE THAT YOU'LL NORMALLY SEE RACING THROUGH THE DESERT, NOT DRIVING ON THE STREETS. NORMALLY WE'D ROLL THIS TRUCK INTO THE SHOP TO START WORKING ON IT, BUT THAT'S NOT WHAT WE'RE GONNA DO TODAY BECAUSE WE'RE GONNA FOCUS ON ONE PART OF THIS TRUCK. THAT IS THE ENGINE. 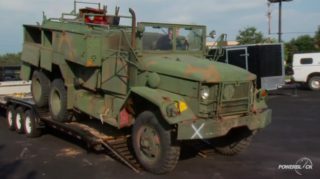 (CHRIS)>> AFTER SEARCHING A PILE OF WRECKING YARDS, WE FINALLY FOUND EXACTLY WHAT WE WERE LOOKING FOR, A SUPER CHARGED FIVE POINT FOUR LITER TRITON VEIGHT. (IAN)>> THIS MODULAR MOTOR WAS ORIGINALLY INSTALLED IN ANOTHER F-150 THAT ALSO TURNED THE TRUCK MARKET ON ITS EAR. NOW THAT PICK UP IS THE FORD F-150 LIGHTNING. IN 1991 FORD FOUNDED THE SPECIAL VEHICLE TEAM, THE SAME GROUP RESPONSIBLE FOR THE RAPTOR. SHORTLY THEREAFTER AT THE '92 CHICAGO AUTO SHOW THE FIRST FORD LIGHTNING WAS UNVEILED. IN PRODUCTION FROM 1993-95, JUST OVER 11,000 LIGHTNINGS WERE PRODUCED, ALL STANDARD CAB TRUCKS AVAILABLE IN BLACK, RED, OR WHITE. 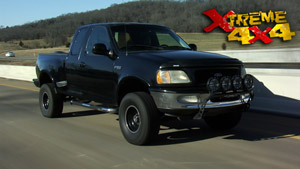 FORD BROUGHT THE MODEL BACK IN 1999 WITH THE NEW BODY STYLE UTILIZING THE FIVE POINT FOUR LITER TRITON VEIGHT. 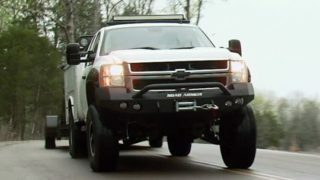 ONCE AGAIN POPULAR SVT RUN WITH 28,000 TRUCKS BEING BUILT IN THE FOLLOWING FIVE YEARS. NOW THIS ENGINE REPRESENTED A LOT OF FIRSTS WHEN IT CAME TO THE TRUCK MARKET. ONE OF THE FIRST TIMES AN EATON SUPERCHARGER WAS BOLTED ON A VEIGHT AND PUT UNDERNEATH THE HOOD OF A TRUCK EVER FROM THE FACTORY. 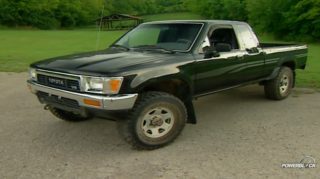 NOW THIS IS AN '03 MODEL. IT'S PUSHING OUT 380 HORSEPOWER, RIGHT AROUND 450 POUND FEET OF TORQUE. NOW YES, THE RAPTOR DOES PUT OUT A LITTLE BIT MORE THAN THAT. WE'VE GOT A COUPLE OF TRICKS UP OUR SLEEVE TO BOOST THIS ENGINE JUST A LITTLE BIT. NOW WE PICKED UP THIS MOTOR FOR $1,000 BUCKS. NOW I KNOW THAT SOUNDS CHEAP, AND IT IS, BECAUSE THE ORIGINAL OWNER TOLD US THERE WAS DAMAGE INSIDE. THE ONLY WAY TO FIND OUT WHAT'S WRONG IS TO TEAR IT APART. WITH THE ENGINE COMPLETELY DISASSEMBLED, THE FIRST THING WE NEED TO CHECK FOR IS ANY OBVIOUS DAMAGE TO THE BLOCK. NOW WE SAW A BUNCH OF RUST IN THESE CYLINDERS WHEN WE PULLED THE HEADS OFF, SO THAT IS GONNA HAVE TO BE DEALT WITH. NOW THE GUY WHO SOLD US THIS ENGINE PRESSURE WASHED IT BEFORE HE DROPPED IT OFF. YOU CAN TELL THAT BY ALL THE SURFACE RUST JUST LAYING DOWN IN THE VALLEY. SURFACE RUST TO THE BLOCK IS NOT A REAL ISSUE. HE DID TELL US THAT THIS BACK CYLINDER WAS DEAD. THERE'S NO COMPRESSION AND IT WAS NOT RUNNING RIGHT. WITH THE ENGINE TORE DOWN WE LOOKED AT THE CYLINDER AND THERE'S NO REAL SIGNS OF PROBLEMS HERE. NOW WE GO OVER TO CHECK THE HEADS AND THE PISTONS. THE PISTONS TELL US A VERY SIMILAR STORY. A LITTLE BIT OF SURFACE RUST AND SOME CARBON BUILD UP, BUT WHEN WE EXAMINE THE ONE THAT CAME OUT OF THE DEAD HOLE NONE OF THE RINGS ARE BROKEN AND THERE'S NO DAMAGE TO THE TOP OF THE PISTON. SO WE'RE GONNA GO AHEAD AND HAVE A LOOK AT THE CYLINDER HEADS, AND ONCE AGAIN THE SAME PROBLEM. THEY LOOK TO BE IN REALLY GOOD SHAPE. NEITHER OF THE VALVES ARE BROKEN AND THERE'S NO OBVIOUS CRACK BETWEEN THE COMBUSTION CHAMBER AND ANY COOLANT AREAS. NOW THAT KIND OF PUTS US AT A STAND STILL. THE OWNER TOLD US IT HAD A DEAD CYLINDER BUT THERE'S NOTHING THAT'S REALLY JUMPING OUT AT US WAS THE PROBLEM. COULD HAVE A BLOWN CYLINDER HEAD GASKET, IT COULD HAVE BEEN A BAD BLOCK, IT COULD BE A BAD HEAD, COULD STILL EVEN BE A BAD PISTON. THE BEST THING TO DO HERE IS WE'RE GONNA CRATE EVERYTHING UP, CARRY IT DOWN TO THE LOCAL MACHINE SHOP. THEY'LL MAGNAFLUX THE HEADS, CHECK TO MAKE SURE THE VALVES ARE SEALING, CHECK OUR BLOCK, CHECK OUR PISTONS, GET EVERYTHING READY, GIVE IT BACK TO US TO REASSEMBLE. (ANNOUNCER)>> COMING UP, REBUILDING OUR VEIGHT FOR POWER AND RELIABILITY. (IAN)>> NOW A LITTLE BIT OF TIME HAS PASSED AND ALL OF OUR PARTS ARE BACK FROM OUR LOCAL MACHINE SHOP. JUST LIKE US, THEY DIDN'T SEE ANYTHING OBVIOUS THAT WOULD BE CAUSING A DEAD CYLINDER, BUT AFTER CHECKING EVERYTHING OUT, THEY SUGGESTED JUST A GOOD FRESHENING UP OF THE ENGINE. NOW IT STARTED WITH THE ENGINE BLOCK, WHERE AFTER MEASURING THE BORE THEY DETERMINED IT WAS BEST TO BORE 20 THOUSANDTHS OF AN INCH OVER AND THEN REHONE IT TO HELP THE NEW PISTON RINGS SEAT. NOW BECAUSE WE BORED THAT BLOCK OVER WE OBVIOUSLY NEEDED NEW PISTONS. SO WE'RE DROPPING THEM OFF AT THE MACHINE SHOP WHERE THEY INSTALLED THEM ONTO OUR FACTORY RODS AND THEN BALANCED THE ENTIRE ASSEMBLY WITH OUR CRANK SHAFT TO JUST INSURE THAT IT'S GONNA WORK REALLY WELL INSIDE THE BLOCK. NOW THEY SPENT THE MOST OF THEIR TIME WORKING ON THE CYLINDER HEADS. THEY STARTED BY MILLING THE SURFACE OF THE HEAD. BASICALLY MACHINING IT SO IT WAS PERFECTLY FLAT. THEN THEY PERFORM WHAT'S CALLED A LEAF CHECK OF THE VALVE SEATS. THEY APPLY A VACUUM TO BOTH THE INTAKE AND THE EXHAUST PORT, AND CHECK TO SEE IF ANY AIR IS LEAKING PAST THE VALVE. NOW IN OUR CASE WE HAD A COUPLE OF LEAKY VALVES. SO THEY SUGGESTED A FULL VALVE JOB ON BOTH HEADS, WHICH WE HAD THEM DO, AND INSTALL NEW VALVE SEALS. THEN OF COURSE EVERYTHING WAS CLEANED UP, BROUGHT IT BACK HERE. NOW WE'RE FINALLY READY TO BUILD OUR ENGINE. WHENEVER I HAVE AN ENGINE MACHINED, I LIKE TO GIVE IT A GOOD CLEANING BEFORE REASSEMBLY. SOAP AND WATER THROUGH THE CYLINDERS FOLLOWED BY A BLOW GUN AND A GOOD COATING OF OIL TO KEEP THEM FROM RUSTING. THE CYLINDER HEADS, I'LL RUN THEM THROUGH OUR SAFETY KLEEN PARTS WASHER AND CLEAN THEM OFF WITH A BLOW GUN. THE FIRST STEP TO ASSEMBLING THE ENGINE IS TO INSTALL THE CRANK SHAFT. WITH THE MAIN BEARINGS IN THE BLOCK, ADD SOME ASSEMBLY LUBE, LOWER THE CRANK SHAFT IN, SLIDE THE THRUST BEARING BETWEEN THE CRANK SHAFT AND THE BLOCK, AND FINISH IT UP BY INSTALLING THE MAIN BEARING CAPS. WHEN YOU'RE WORKING ON A MODERN ENGINE LIKE OUR FIVE POINT FOUR, QUITE OFTEN YOU'LL COME ACROSS BOLTS THAT ARE KNOWN AS "ONE TIME USE" OR "TORQUE TO YIELD" BOLT. NOW THAT HAS TO DO WITH SOMETHING THAT'S KNOWN AS BOLT STRETCH. SEE WHEN YOU TIGHTEN A BOLT DOWN, LIKE A MAIN BEARING CAP BOLT. WHEN THE HEAD OF THE BOLT REACHES THE TOP OF THE CAP, IT WILL STOP MOVING, BUT THE THREADS ARE STILL PULLING DOWN INTO THE BLOCK. THAT CAUSES THE BOLT TO ACTUALLY STRETCH. NOW THAT BOLT STRETCH IS WHAT GIVES US OUR CLAMPING FORCE ON THE MAIN BEARING CAP. THE PROBLEM IS AFTER A LOT OF USE TIGHTENING, AND LOOSENING, AND REINSTALLING, AND REBUILDING, THE BOLT CAN BECOME WEAK AND IT CAN CAUSE IT TO FAIL. THAT'S WHY MANUFACTURERS MOVED TO TORQUE YIELD FOR ONE TIME USE ONLY BOLTS. NOW WE'RE LUCKY ON OUR ENGINE. ACCORDING TO FORD WE CAN REUSE THE MAIN BEARING CAP BOLTS FIVE TIMES BEFORE THEY NEED TO BE REPLACED. NOW THE SIDE BOLTS ARE INFINITELY REUSABLE. THEY ARE NOT TORQUE TO YIELD. NOW WE'RE VERY CONFIDENT THIS ENGINE HAS NEVER BEEN REBUILT BEFORE. IT HASN'T BEEN BORED OVER, AND IT REALLY LOOKED LIKE IT HADN'T BEEN REBUILT. BUT THIS TIME, AFTER I TORQUE THE MAIN BEARING BOLTS, I'M GONNA GO AHEAD AND TAKE THE CENTER PUNCH AND PUT ONE DOT ON THE TOP OF EVERY SINGLE BOLT. THAT WAY IN THE FUTURE IF ANYONE TAKES IT APART, HOPEFULLY THEY'LL REALIZE THAT THAT DOT MEANS THAT THESE BOLTS HAVE BEEN USED ONE TIME. STARTING WITH THE MIDDLE CAP IN THE BLOCK, THE MAIN BEARINGS ARE TORQUED TO 45 FOOT POUNDS. BY TURNING THE CRANK SHAFT 90 DEGREES AFTER EVERY CAP, IT INSURES THAT WE DON'T HAVE A PROBLEM AFTER ALL THE MACHINE WORK WE'VE HAD DONE TO THIS ENGINE. THEN THE SIDE BOLTS CAN BE TIGHTENED TO 30 FOOT POUNDS. NEW PISTON RINGS ARE INSTALLED ONTO THE PISTONS STARTING WITH THE LOWER OIL CONTROL RING AND SETTING THE GAP AT THE WRIST PIN LOCATION. BOTH COMPRESSION RINGS ARE ALSO INSTALLED WITH THE GAPS 180 DEGREES APART. THEN THE PISTONS ARE CAREFULLY SLID BACK INTO THE BLOCK WITH A LIGHT COATING OF OIL. (ANNOUNCER)>> UP NEXT, POWER ADDERS FOR OUR FIVE POINT FOUR LITER. (IAN)>> WHEN YOU'RE WORKING WITH A MODERN ENGINE LIKE WE ARE, ONE OF THE HARDEST THINGS TO FIND IS A COMPLETE REBUILD KIT. SURE ON AN OLD SCHOOL SMALL BLOCK CHEVY, FORD, OR CHRYSLER IT'S EASY JUST TO GO ONLINE AND FIND EVERYTHING YOU NEED ALL BOXED UP IN ONE SPOT. BUT NEWER ENGINES ARE A LITTLE BIT MORE DIFFICULT. FINDING EVERYTHING YOU NEED IN ONE PLACE CAN BE HARD, AND WE LUCKED OUT. 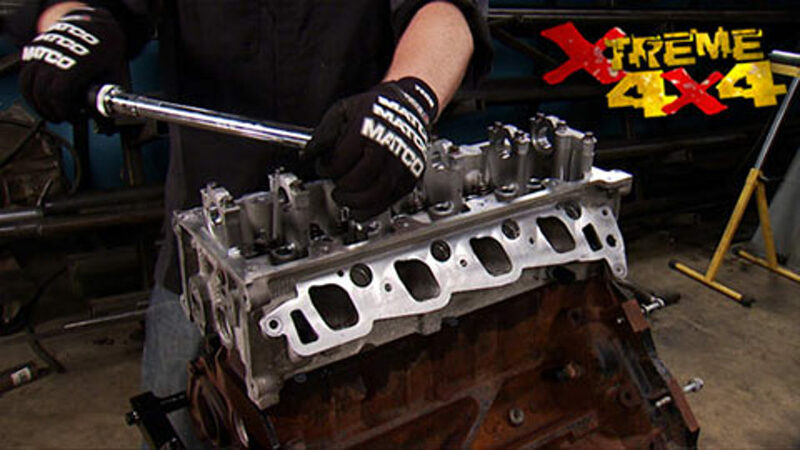 WE WERE ABLE TO GET EVERYTHING THAT WE NEED FOR OUR ENGINE ALL FROM ROCK AUTO DOT COM. SIMPLY WENT ONTO THEIR WEBSITE, FOUND THE MAKE AND MODEL THAT OUR ENGINE CAME IN, AND WERE ABLE TO PICK EVERYTHING THAT WE NEEDED AND PUT TOGETHER BASICALLY A FULL REBUILD KIT. NOW WE'RE NOT LIMITED TO JUST FACTORY STUFF. WE WERE ABLE TO UPGRADE SOME OF THE COMPONENTS, LIKE THESE FEL PRO MULTILAYERED STEEL OR MLS HEAD GASKETS. NOW THESE ARE SPECIFICALLY DESIGNED FOR BOOSTED APPLICATIONS LIKE OUR FIVE POINT FOUR. THEY'LL BE ABLE TO HANDLE EXTRA PRESSURE BECAUSE WE ARE GONNA TURN THE PUMP UP JUST A LITTLE BIT. WITH THE GASKET IN PLACE ON THE BLOCK, WE'LL SET THE CYLINDER HEAD ON AND COAT BOTH THE THREADS AND THE HEADS OF OUR NEW BOLTS WITH SOME OIL. THEN TORQUE THEM DOWN TO THE MANUFACTURER'S SPECIFICATIONS, WHICH MEANS YOU TORQUE THEM, TURN THEM 90 DEGREES, BACK THEM OFF ONE FULL TURN, TORQUE THEM AGAIN, AND TWO MORE TURNS OF 90 DEGREES EACH. WE'LL FOLLOW THAT WITH THE LIFTERS AND THE ROLLER FOLLOWERS, AND OUR TOP END IS COMPLETE. NOW SO FAR EVERYTHING THAT WE'VE DONE TODAY PERTAINS TO ALMOST ANY VEIGHT ENGINE BUILD. NOW WE'RE AT THE PART THAT MAKES THE FIVE POINT FOUR DIFFERENT THAN ANYTHING ELSE. IT IS A TWIN CAM ENGINE. BASICALLY TWO OVERHEAD CAMS, AND TIMING THEM IS ESSENTIAL BECAUSE THE FIVE POINT FOUR IS AN INTERFERENCE ENGINE. NOW WHAT THAT MEANS IS IF YOUR VALVE TIMING IS OFF AT ALL, WHEN THE PISTON IS COMING UP THE CYLINDER, IF A VALVE OPENS AT THE INCORRECT TIME THEY CAN CONTACT EACH OTHER DAMAGING BOTH THE VALVE AND THE PISTONS. SO TIMING IT IS ESSENTIAL. THROUGHOUT THE ENTIRE REBUILD I'VE MADE SURE THAT THE KEY WAY ON THE CRANK WAS POINTING AT 12 O'CLOCK. THAT'S BASICALLY THE NEUTRAL POSITION IN THIS ENGINE. THAT MEANS THAT ALL THE PISTONS ARE DOWN OUT OF THE WAY OF THE VALVES SO YOU CAN ROTATE THE CAMS AND NOT WORRY ABOUT ANY CONTACT. NOW TO START TIMING YOU GET YOUR TIMING CHAINS. WE GOT A COMPLETE NEW SET. NOW THERE'S TIMING MARKS ON THE CHAINS. THERE'S TWO COLORED LINKS THAT'LL LINE UP WITH SOME LINES ON THE CAM SHAFT AND ONE SOLID LINK THAT WILL LINE UP WITH A DOT ON THE CRANK GEAR. THEN ONCE WE HAVE THAT COMPLETELY TIMED, WE CAN ADD THE GUIDES AND THE SPRING LOADED TENSIONERS THAT COME LOCKED IN PLACE WITH THESE LITTLE KEYS. WHEN YOU HAVE EVERYTHING SET UP AND READY TO GO, YOU PULL THE KEY OUT, THE TENSIONER WILL APPLY TENSION TO THE CHAIN, AND THEN YOU WON'T BE ABLE TO MOVE IT. NOW SO FAR EVERY PART OF OUR ENGINE REBUILD HAS BEEN DONE USING STOCK TYPE COMPONENTS. WE DID THAT TO KEEP THE ENGINE GOOD AND RELIABLE. BUT AS WE'RE BUTTONING IT UP WE CAN ADD A COUPLE OF EXTRA POWER ADDERS TO IT. WE'RE GONNA START BY SCREWING IN SOME ETHREE DIAMOND FIRE SPARK PLUGS, AND THEN FINISH THOSE OFF WITH SOME ACCEL SUPER COILS. LIKE MOST MODERN VEIGHTS, OUR FIVE POINT FOUR DOES NOT USE A DISTRIBUTOR AND A BUNCH OF SPARK PLUG WIRES. IT HAS A COIL PACK FOR EVERY CYLINDER, MAKING IT MUCH MORE EFFICIENT. THROW IN AN ACCEL SUPER COIL AND A HIGH QUALITY SPARK PLUG LIKE THE ETHREE, AND IT JUST HELPS ENHANCE THE BURN INSIDE THE CYLINDER GIVING US JUST A LITTLE BIT MORE POWER. NOW INSTEAD OF RELYING ON THE FACTORY EXHAUST TO GET ALL THE EXHAUST OUT OF THE ENGINE, WE'RE GONNA SWAP ON A SET OF THESE JBA SHORTY FACTORY FIT STYLE HEADERS. NOW THEY'RE DESIGNED TO FIT INTO THE SAME SPACE AS AN EXHAUST MANIFOLD, AND EVEN REUSE THE FACTORY DOWN PIPES AND CATALYTIC CONVERTERS. BUT INSTEAD OF JUST A CAST MANIFOLD, IT USES THESE LONG MANDREL BENT TUBES TO JUST IMPROVE FLOW AND PICK EVEN A LITTLE BIT MORE POWER. TO INSURE OUR HEADERS STAY TIGHT, WE'RE USING STAGE EIGHT LOCKING FASTENER HEADER BOLTS. ONCE THE BOLT IS INSTALLED, THE LOCKING TAB IS SLID OVER THE HEAD AND IT'S HELD IN PLACE BY A SMALL ECLIP. (ANNOUNCER)>> LOOKING FOR AN AFFORDABLE WAY TO JOIN THE HIGH SPEED WORLD OF DESERT RACING, WE CAN HELP. 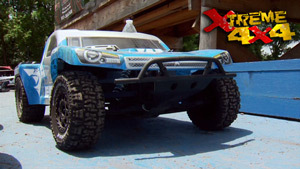 (IAN)>> WE PROMISED YOU GUYS AN IN DEPTH LOOK AT SOME OFF ROAD VEHICLES THIS YEAR. TODAY WE'RE GONNA HAVE A LOOK AT AN OFF ROAD DESERT RACE CAR, BUT NOT JUST ANY KIND OF RACE CAR. THIS JEEP CHEROKEE HAS BEEN PUT TOGETHER FOR A SPECIFIC TYPE OF RACING CALLED JEEP SPEED. JEEP SPEED WAS THE BRAIN CHILD OF CLIVE SKILTON, WHO DREAMT OF A TYPE OF DESERT RACING THAT WOULD HAVE SPECIFIC RULES AND REGULATIONS THAT MAKE THE VEHICLES NOT ONLY AFFORDABLE, BUT ON AN EQUAL PLAYING FIELD, MAKING THIS CLASS KIND OF A DRIVER'S CLASS. THE RULES ARE ACTUALLY PRETTY SIMPLE. YOU NEED TO START WITH A JEEP PRODUCTION VEHICLE AND MODIFY IT IN A SPECIFIC WAY IN ORDER TO RACE. THINGS LIKE KEEPING THE FACTORY ENGINE IN THE FACTORY LOCATION, OFF THE SHELF SUSPENSION SYSTEMS, AND A STOCK DANA FRONT AXLE. THE REAR END CAN BE SWAPPED OVER TO A FORD NINE INCH, AND YOU CAN MODIFY THE HOUSINGS FOR STRENGTH. 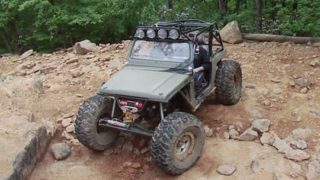 THESE TYPES OF LIMITED MODIFICATIONS MAKE FOR SOME INTERESTING RACING THAT OFTEN ENDS WITH CLOSE FINISHES AND EXCITING SPOTS WHERE THE JEEP SURPRISE A LOT OF THE FANS. INSIDE JEEP SPEEDS ARE ALL BUSINESS. NO CARPET, NO AIR CONDITIONING, NO CREATURE COMFORTS IN HERE. IT ALL GETS THROWN AWAY AND REPLACED WITH A COUPLE OF SUSPENSION SEATS FOR THE DRIVER AND CODRIVER, AND GAUGES TO MONITOR THE ENGINE. 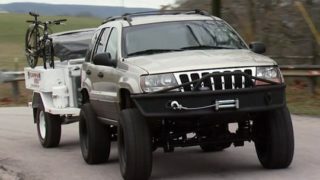 A LOT OF MODIFICATIONS NEED TO BE MADE TO A STOCK JEEP CHEROKEE IN ORDER TO TURN IT INTO A RACE CAR. 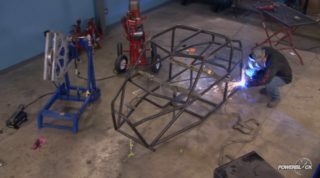 ONCE A CAGE IS BUILT AND THE SEATS ARE IN, THE TRUCK WILL NEED TO BE UPGRADED IN ANY POSSIBLE FAILURE AREA. TUBING IS ADDED TO STRENGTHEN THE FRONT UNIBODY SECTION WHERE THE SPRINGS RIDE. 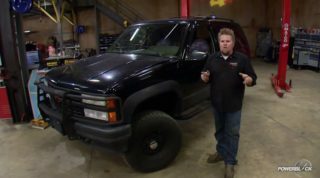 YOU HAVE TO RUN STOCK SUSPENSION ON THE TRUCK, BUT YOU CAN ADD HYDRAULIC BUMP STOPS TO HELP IT WHEN IT BOTTOMS OUT. AND LIKE ANY SERIOUS OFF ROAD RACE CAR, A SET OF RACE SPECIFIC SHOCKS ON ALL FOUR CORNERS. 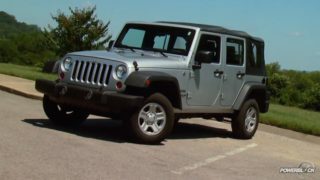 IN THE CASE OF THIS JEEP, BYPASSES ON THE REAR TO CONTROL THE LEAVES AND TUNABLE SHOCKS UP FRONT WITH EXTERNAL RESERVOIRS. AND OF COURSE, THINGS LIKE FRESH AIR SYSTEMS FOR THE HELMET, TRANSMISSION AND OIL COOLERS, A HUGE FUEL CELL, AND A SPOT TO CARRY TOOLS AND EQUIPMENT TO REPAIR THE TRUCK DURING THE RACE. JEEP SPEED WILL GIVE YOU A LOT OF BANG FOR YOUR BUCK WHEN WE'RE TALKING ABOUT DESERT RACING. SO IF YOU'VE GOT THE ITCH TO GO FAST IN THE SAND, HEAD ON OUT AN CHECK OUT A JEEP RACE. I'VE GOT TO WARN YOU THOUGH, YOU MIGHT GET HOOKED. AND BEFORE YOU KNOW IT YOU'LL BE SHOPPING OR A JEEP CHEROKEE. 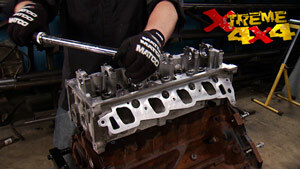 FOR DETAILS ON ANY OF THE PRODUCTS SEEN IN TODAY'S EPISODE, HEAD ON OVER TO POWERBLOCK TV DOT COM.